Workplace Solutions Sp z.o.o. were tasked with another phase of design for the Nordea IT offices located in Gdynia, Poland. The architectural icons of Scandinavia have taken over several floors of the Nordea headquarters building in Gdynia. Bike paths, the vivid Superkilen city square of Copenhagen, the famous opera house in Oslo, and the Temppeliaukio church of Helsinki – all of them served as inspiration for the Scandinavia Office. Across the 5 floors and 5,500 sqm of the Scandinavia Office, we recall the spirit of Nordea’s origin. Urban planning involves the creation of places where people can build relationships. 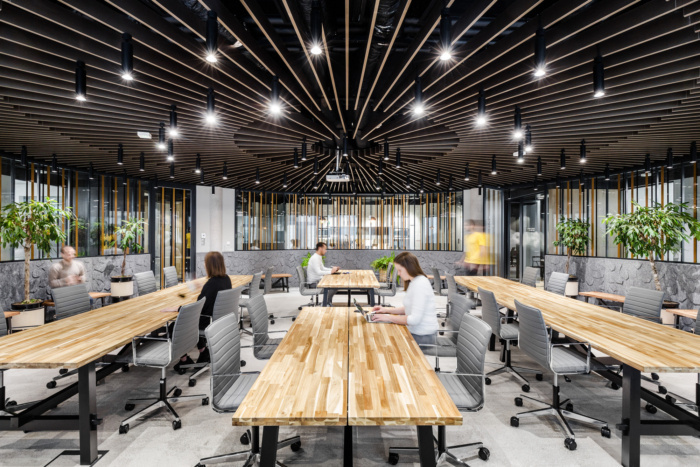 The elements shared by urban planning and work environment design are helping to bring people closer, connecting them, skillfully mixing functions, eliminating barriers and creating spaces that have an extrasensory impact on the user. Through all this, we wanted to create a unique, vibrant place full of life, akin to a multi-functional city square. An office space where the user remains relaxed and comfortable. The themes involve the architecture of four Scandinavian capitals, which together form the basis for the arrangement concept of the Łużycka Office Park. At Scandinavia Office, the narrative design fulfills both the non-material and psychological functions. The very identity of the organization is engraved into the office space, bringing associations and emotions to mind and the desire to be there. At Scandinavia Office, design follows on from functionality. In this office, we have combined the knowledge gained from our research on working environments for agile teams with the conclusions from previous projects for Nordea, and designed a workplace in which as much as 40% of the space consists of informal areas supporting spontaneous meetings and knowledge exchanges. This idea is in line with the Nordea Unlimited concept, developed and implemented in the Scandinavian branches of the organization. It is based on the flexible use of the workspace, according to the types of activity undertaken during the day. It is an adaptation of a modern work environment model known as the Activity Based Workplace – one that is flexible, based on numerous interactions and cooperation. Together with programmers, we developed the Agile workplace concept, the primary elements of which are home zones – work zones, tailored to different types of activity: daily team stand-up meetings, work which requires focus, video conferencing, brainstorming, as well as ad-hoc meetings. Thanks to the versatility of the solutions created for the Seaport Office project, we were also able to implement them into this project easily, while expanding the design to include the previously described common zones, which are necessary for employees in building relationships and generating new ideas. Thanks to this, every employee can find a place for themselves. This is a place that, first and foremost, allows us to answer the question “Why do we want to work?” instead of just “Where do we want to work?”. Designer: Workplace Solutions Sp z.o.o.